Scientists from up and down the West Coast are gathering in Seattle this week for a conference on a giant mass of warm ocean water that has lingered in the Northeast Pacific. After over two years, the Blob may be dissipating. But its effects may last for years. The second Pacific Anomalies Workshop runs Wednesday through Thursday on the University of Washington campus. 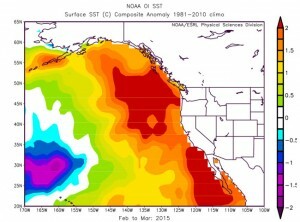 Washington state climatologist Nicholas Bond says scientists will discuss how The Blob is affecting marine life and climate, and what kind of impact El Niño is having on the warm water anomaly. This is the second conference on The Blob. The first was held last May in San Diego. Scientists tried to anticipate impacts on marine life and climate. Bond identified the increasing sea surface temperatures starting in October 2013 and coined the nickname The Blob.